Finished the conversation on my Saiga .308. Bought the kit from dinzag and it worked great. Very sweet trigger. My profile pic is of the finished product. Thanks for the responses. I'm not a shotgunner by trade so to speak so the info is very informative. I have what is probably an older variant of the MKA. 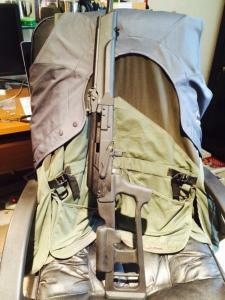 One piece polymer lower and buttstock and a feat of engineering to break the gun down. Mags and lube sound like two doable things to try to get the gun to run better. I'll try that first. Thanks again. I love my MKA but I can't get anything but high brass to run in it. I polished the carrier but it helped very little. Any kits for these guns to make the system run low brass? Appreciate any help. Thanks for the replies. I have decided to convert the rifle after doing some research. I have a kit from dinzag on the way. I'll post pics when I get it finished. I am new to Saiga/AK-47 rifles. I have built numorous ARs in various calibers. My head is spinning about conversion and 922r requirements and the like for these rifles. All I need an answer to is what skeletonized stock will fit my 308 rifle that is an import? All I want is a pistol grip configuration without running into 922r issues. I plan to do a conversion later but for now just the right stock is all I need. All the ones I have seen that are russian made state they don't fit saiga 308 100 series rifles. Any help would be appreciated and I will try to do my own research via this forum in the future. Looking foward to learning a new platform.